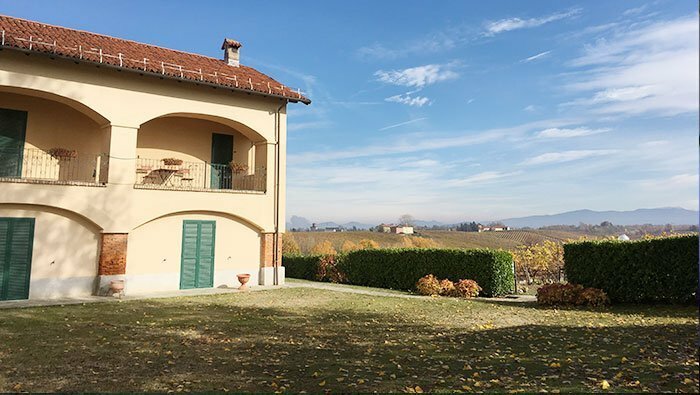 La Marchesa is a farmhouse with swimming pool located in Piedmont, in the heart of Monferrato, on the enchanting hills of the Gavi, a stone’s throw from Novi Ligure: a true high level wine tourism. The area is that of the ancient Monferrato, historical meeting point between Piedmont, Lombardy and Liguria. 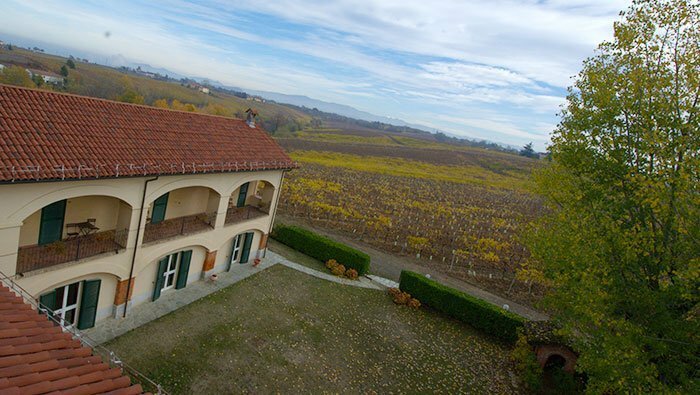 The Marchesa Estate hosts a charming resort in Monferrato, located in a privileged position among the rows of vines, woods, gardens, orchards and an enchanted lake: a cozy retreat in which to detoxify from the accumulated stress of life in the city. The lake, embellished with lotus flowers and palm trees, can be reached with a short walk from the farm. Guests who love fishing can try their passion: fishing is reserved for our guests. The resort is located in a historic seventeenth-century house and, thanks to a precious restoration that has scrupulously preserved its original structure, it retains its ancient charm. 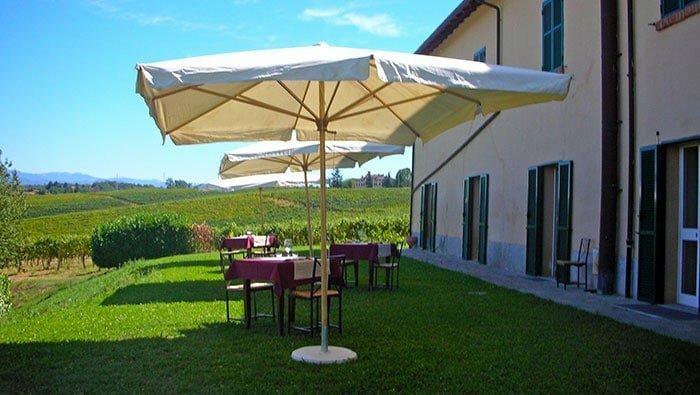 The combination of ancient and modern, of history, vineyards, local flavors and country landscapes, gives the agriturismo, taken care of in every detail, a unique charm: a historical location in an incomparable context for tourists looking for an unique place to stay in Italy. We try to convey to our guests the passion for history and respect for the traditions of our places, suggesting them art itineraries, guided tours, tastings, bike or foot paths (we are along one of the paths of the ancient Via Francigena). It is all available to those wishing to spend a holiday in the Italian countryside, play golf, eat typical Italian dishes in the restaurant of the farmhouse, organize weddings, conferences or events in the evocative atmosphere of a large winery managed according to the strategy of total sustainability. The Marchesa farmhouse is gay friendly. The Marchesa farmhouse with private swimming pool has 12 rooms furnished with country furniture, a typical Piedmontese restaurant with two large rooms and is surrounded by greenery and the peace of the countryside: the rooms have a spectacular view over the Piedmont hills and on the vineyards of Gavi, Monferrato and Albarossa, owned by the company. 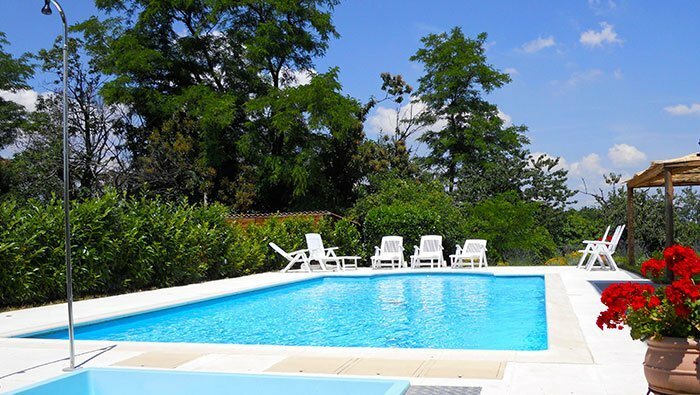 The pool, reserved for guests of the farm, offers moments of relaxation accompanied by a good book and a glass of wine, fully experiencing the classic Italian holiday, in one of the most beautiful corners of Piedmont. On sunny days without mist it is possible to admire the entire crown of the Alps, clearly distinguishing the shape of the main mountains, among which the Monviso stands out with elegance. Ours is the classic farmhouse for children, who are welcome and have plenty of space to play and to discover nature, accompanied by their parents. The area is always ventilated and the agritourism has no mosquitoes. The guests of the agritourism are welcomed for breakfast in the Monferrato Hall. The breakfasts, healthy, tasty and natural, are served with homemade cakes, typical dishes, jams made with fruit from our garden, bread and biscuits made with our wholemeal flour, honey produced by a company close to us. Breakfast is the most important meal of the day and we treat it with love. 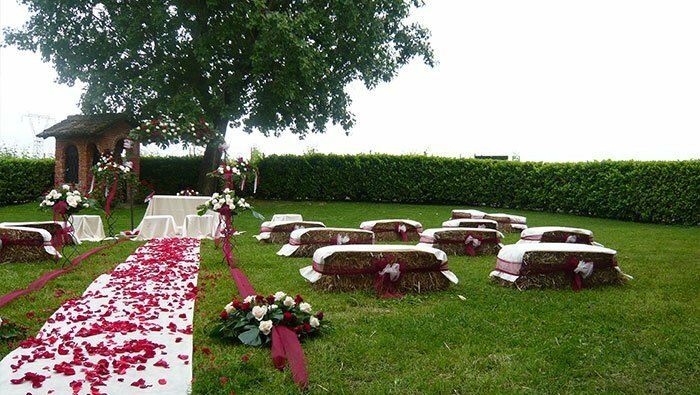 The location in open country, away from homes, the availability of two large rooms for up to 130 people, make The Marchesa agritourism the ideal venue for those who want to organize their wedding in a farmhouse in Italy, among the green hills of Monferrato. The spouses and their guests can sleep in our rooms. The turret room of the villa, with spectacular 360 degree views, is well known as “the bride and bridegroom room”. 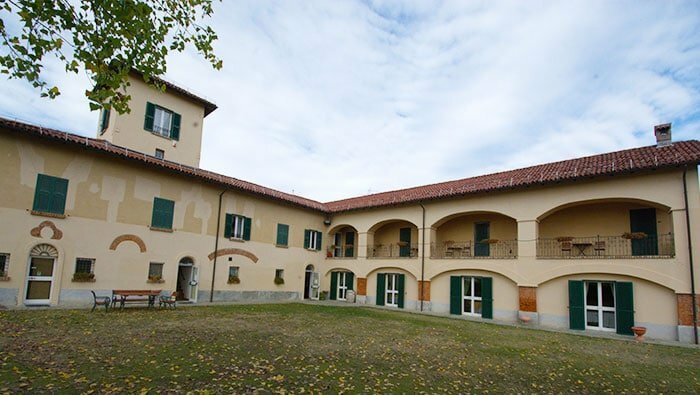 The farmhouse of The Marchesa Estate is a perfect location for weddings, family events and business in Italy and in the Piedmont countryside. The proximity of the Marchesa farmhouse to the numerous industries of Piedmont, Lombardy, and of the Liguria areas, represents an excellent possibility, for those who travel for work during the week or during the weekends, to sleep in silence away from traffic, having dinner with quality products and a good glass of our wine. We have activated special agreements with local companies for the midweek days. 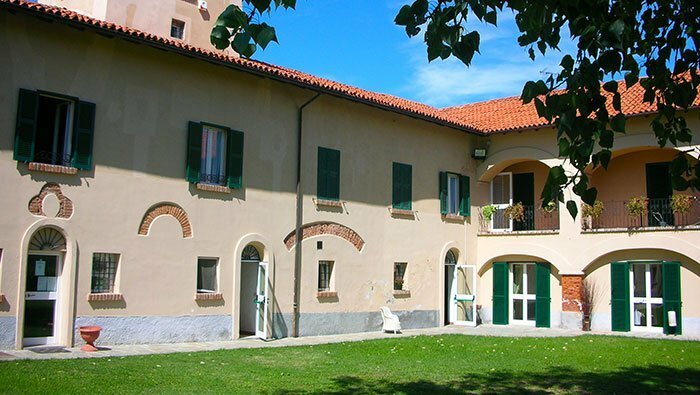 Milan, Turin and Genoa are easily reachable from the Marchesa farmhouse for those who want to spend a business day or a day of vacation. 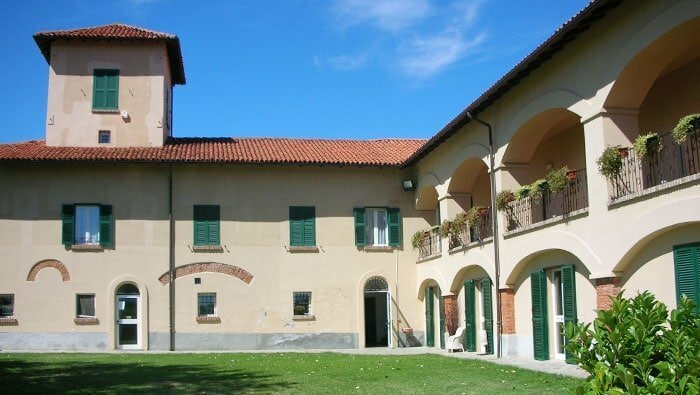 The Marchesa farmhouse is located near the Outlet of Serravalle. Our guests often take advantage of only 4km that separate us from the outlet, to use our structure as a base to move easily to the outlet stores. Shoppers have the opportunity to get up early in the morning and, after a genuine breakfast with our local products, to spend the whole day shopping. 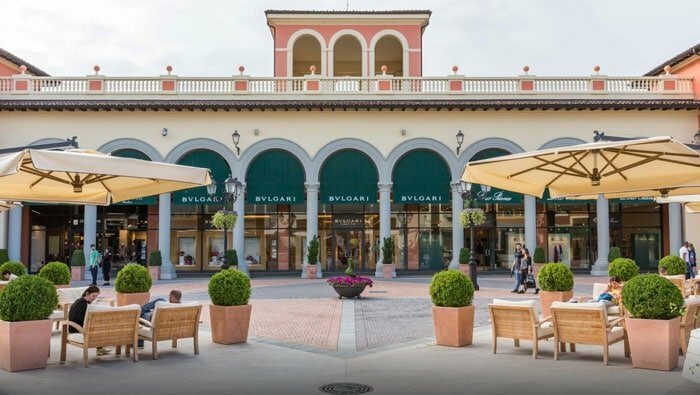 During the sales period, we recommend booking well in advance, because Marchesa is one of the most popular agritourism for the Serravalle Outlet customers.